The Longchamp racecourse possesses a unique image and unique qualities within the great horse racing meetings. Our proposal of contemporary architecture intends to renew its image and to establish an evolution towards a new era for Longchamp. Our reflection began from the simple beauty offered by the great lines of the space, from the wide and distant visions, the green grass fields and the great trees. We wanted to return to this atmosphere of proximity with the horses and trees, proximity procured by the parade ring and that needs today to be moved, redesigned and rebuilt. 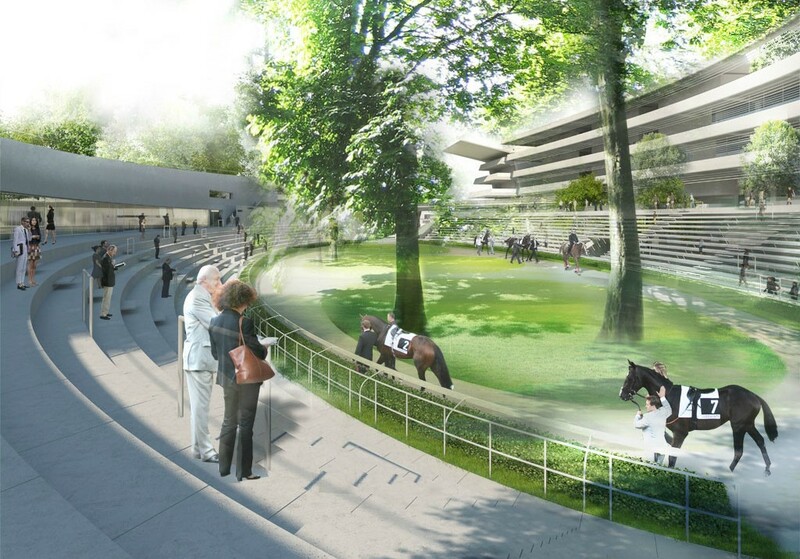 The mythic paddock and the stands are the heart of the New Longchamp. For the public, the racecourse is a vast open air theater with multiples scenes that need to be connected in time and space. 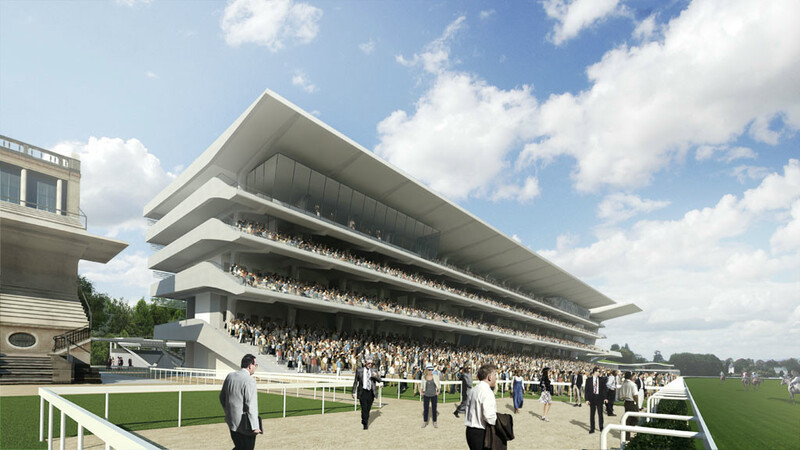 The general consistency of these architectures, presenting different scenes, led us to establish an aesthetic and practical complementarity between the stands, the paddock stands and the weighing rooms building. 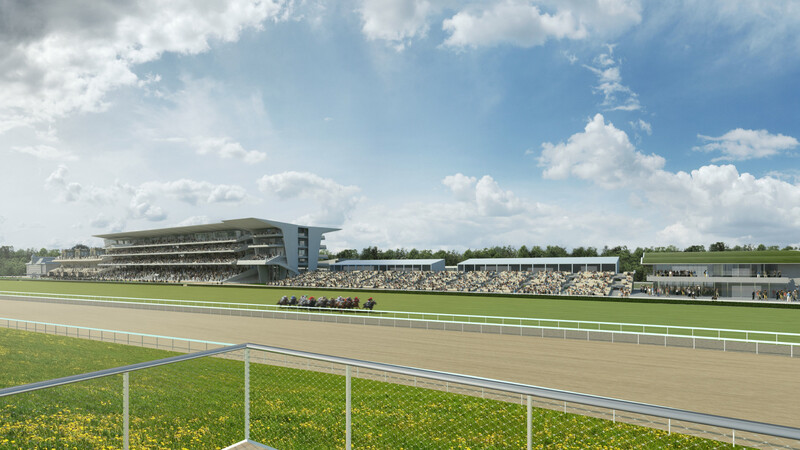 It is a new overview that leads to connect the different areas of the racecourse, which inspires an “architecture of movement”. The aim is to organize the almost ritual spectacle of horse racing and its sequences. The relation between the stands and the parade ring is therefore in this case the catalyst. Our project combines the functions into an intimate and practical relation, in terms of form: by the curves that are overlaid, and in terms of physical relation: giving the opportunity to understand the different spaces, the circulations and the accesses. Regarding the weighing of the horses, the project gathers around the center rings characterized by an elliptical spiral of rising stands, followed by the back balcony curves of the great stands on the upper side, offering thus magnificent views for all the public on this central place of horse presentation. The permeability between the two facades of the stand offers the possibility for the public to move freely and at the same time to stay focused on the event, being constantly invited to play and to bet, the bet counters being easily accessible, always visible and on the spectator’s way. Finally this organization ensures the operating of the specific flows that form the different paths of the spectators, the betters, the horses, the jockeys, the owners, the VIP and the contributors. This organization needs to be perfect. The diverse elements of architecture get together in a single gesture, whose aesthetic remembers the curves, the most ancient images and memories of the hippodromes since the Roman antiquity. 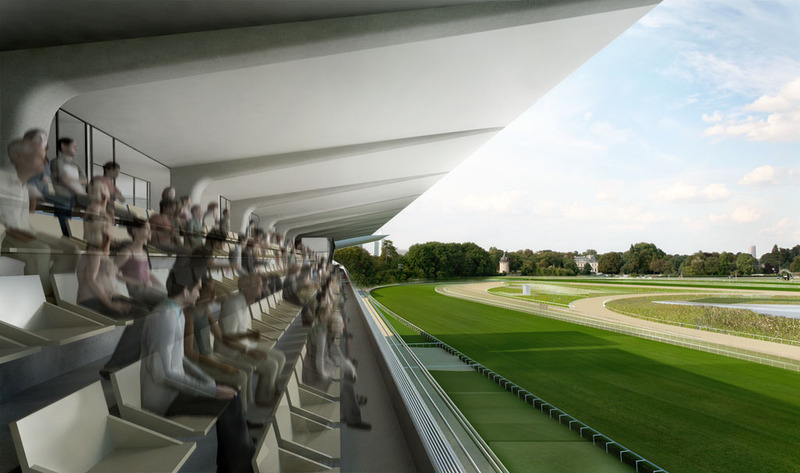 The architecture of this project reflects the particular character of horse racing: the speed, the beauty and slenderness of the galloping horses, celebrated by man through the centuries, the spectacle of the open spaces of the race. Around this enlarged ellipse, the park racecourse develops into a pleasant walk that continues around the racetracks and the Bois de Boulogne. The races offer a living spectacle, always in movement. In this project, the spectators move in a fluid manner, they always have an interesting point of view of the race and of all the events that precedes it, such as the horses’ presentation. Thereby, the New Longchamp proposes multiple points of view of the spectacle. 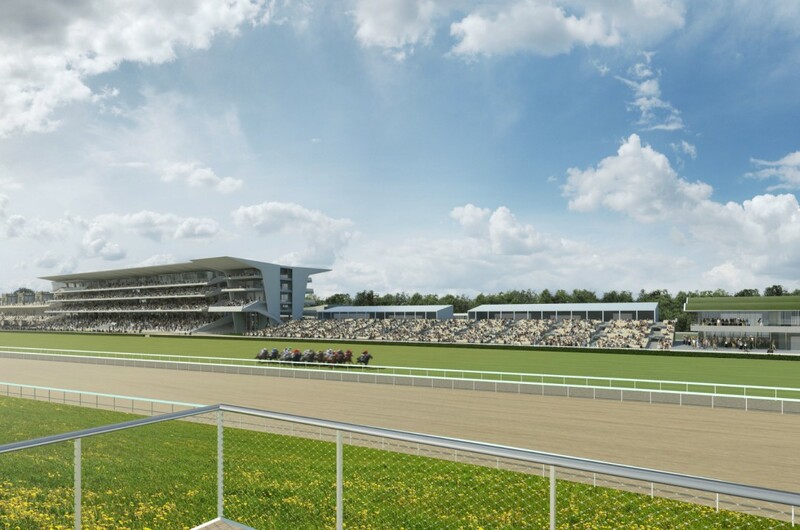 From the stands, the public can easily reach the parade ring but also choose to have an overview from the stand and in that way watch the horses’ presentations and see them going from the stables to the race tracks. 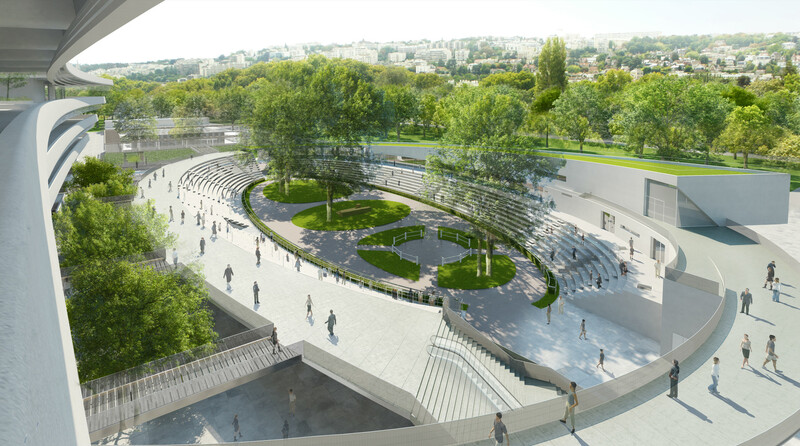 The renovation of the historical part of the hippodrome participates in keeping alive the spirit of such a place, the new architecture offering a coherent and contemporary aesthetic. 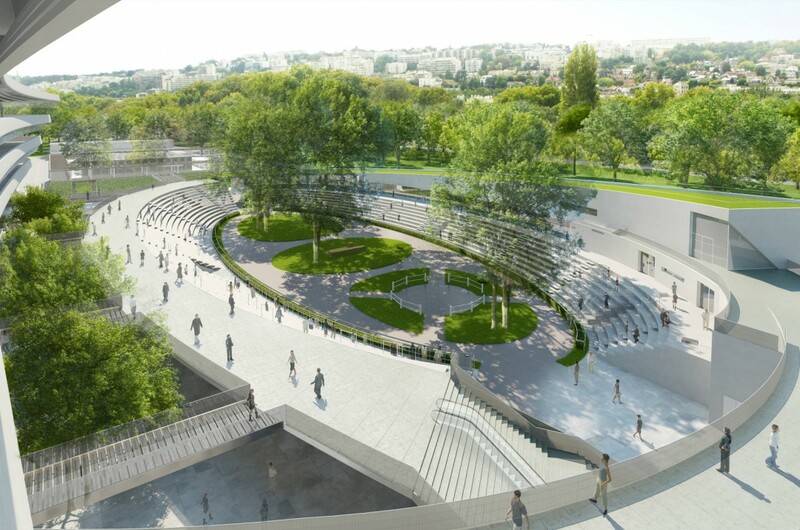 In the respect of the values of horse racing, this project invites Longchamp to enter the third millenary and invites a new public to discover it. 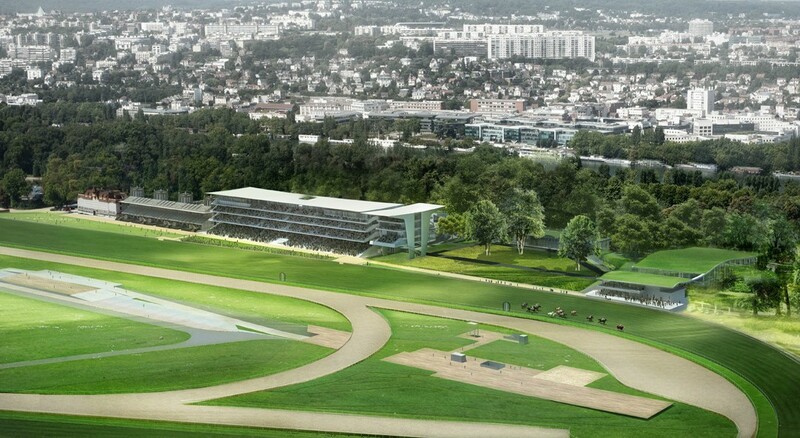 Restructuring of the Longchamp racecourse.